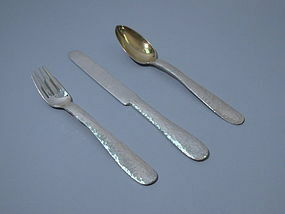 Craftsman sterling silver 3-piece youth place setting. Made by Tiffany, ca 1910. Hammered handles. Spoon bowl lightly gilt. Knife blade sterling silver. An example of the Craftsman influence on the American silver giant. Fully hallmarked. Delicate patina. Excellent condition.